[144 Pages Report] The overall performance analytics market is expected to grow from USD 0.96 billion in 2015 to USD 2.59 billion by 2021, at a CAGR of 18.7% from 2016 to 2021. Performance analytics is a set of functionalities that help the organizations to automate performance analysis of various business functions. The user can easily map the performance of their organization against a standard pre-defined set of KPIs and identify the causes for variations. The users monitor, measure, and analyze the performance of business functions such as financial operations, sales, marketing, workforce, and IT operations in real-time with easy interactive dashboards and reports. The base year considered for the study is 2015, and the forecast has been provided for the period between 2016 and 2021. Today, the organizations across the world are flooded with structured and unstructured data with the tremendous growth in IoT and mobile devices adoption. This data describes central characteristics of an organization and is a pivotal part of business progression. To improve their market presence and build powerful product portfolio, organizations have started investing significant amount of capital on data analysis. Traditionally, the organizations were using legacy technology and operating multiple systems for data reporting. However, due to this fragmented data, the leader of the organization were forced to spend more time on reconciling and preparing data, which prevented them from identifying pain points and improving business performance. Performance analytics tools empowered the business users to create real-time business performance reporting, which helped them to make fact-based decisions. During this research study, major players operating in the performance analytics market in various regions have been identified, and their offerings, regional presence, and distribution channels have been analyzed through in-depth discussions. Top-down and bottom-up approaches have been used to determine the overall market size. Sizes of the other individual markets have been estimated using the percentage splits obtained through secondary sources such as Hoovers, Bloomberg BusinessWeek, and Factiva, along with primary respondents. The entire procedure includes the study of the annual and financial reports of the top market players and extensive interviews with industry experts such as CEOs, VPs, directors, and marketing executives for key insights (both qualitative and quantitative) pertaining to the market. The figure below shows the breakdown of the primaries on the basis of the company type, designation, and region considered during the research study. The performance analytics ecosystem comprises vendors, such as, IBM Corporation (US), Oracle Corporation (US), SAS Institute Inc. (US), SAP SE (Germany), Siemens AG (Germany), Adaptive Insights (US), Xactly Corporation (US), Optymyze (US), ServiceNow, Inc.( US), and Callidus Software, Inc. (US). Other stakeholders of the performance analytics market include application design and software developers, system integrators, IT service providers, consulting service provider, managed service provider, market research and consulting firms, and cloud service providers. In June 2016, IBM partnered with Axciom to provide powerful analytics solutions to the customers for deriving accurate insights in a short period. This would help the data scientists and marketing analysts to understand customers and predict future behaviors of the customers. In February 2016, SAP acquired Roambi to provide mobile access to analytics solutions to everyone. Roambi’s mobile-centric analytics and visualization solution allow workforce to access critical information anywhere, any time. In February 2015, SAS and ICMA have been delivering its ICMA Insights to cities, towns, and countries across U.S. to compare their performance data with other participants’ data. The solution now has been delivered to more than 100 government entities to analyze and report performance. The overall performance analytics market is expected to grow from USD 1.10 Billion in 2016 to USD 2.59 Billion by 2021, at a Compound Annual Growth Rate (CAGR) of 18.7% from 2016 to 2021. Simple to utilize and integrated business applications of performance analytics software will propel the growth of the market. Major driver of the market is rising prevalence of metrics-driven business performance assessment. Performance analytics platform is a user-driven process and is a part of business intelligence architecture, mainly aimed at creating interactive reports and exploring performance-based data. Data gathered from various back-end systems and sources, are utilized for analyzing and understanding historical performance, present performance, and provide recommendation to mitigate business risk through real-time view of KPI and future indicators from the data set. Performance analytics is a management discipline process that let companies have increased focus on supporting integrated management process on the operational, financial, and strategic level, and enabling companies to closely and effectively monitor their overall performance. The rising need for data-driven decision-making and understanding past performance and future performance pattern and trends that would assist the companies to maintain the require performance level has made performance analytics as a must needed technology on both business and IT sector of the organization. Performance analytics can contribute significantly towards interpretation and sharing of insights from thorough data analytics, enabling nontechnical SMBs to perform analysis in a self-directed manner. 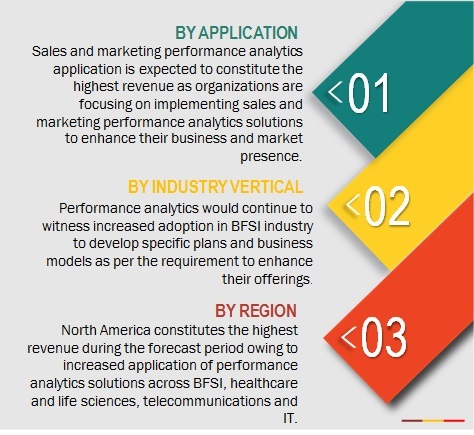 The performance analytics market is segmented by component, professional service, application, analytic type, organization size, deployment model, industry vertical, and region. Performance analytics software are used widely by major industry verticals such as BFSI, retail & e-commerce, telecommunications & IT, energy & utilities, government, healthcare, manufacturing, construction & engineering, and others (hospitality services, education, and travel & hospitality), for different business needs. Globally, performance analytics software and services have gradually started to take over traditional BI tools used for assessing the overall performance of the company, which could not be utilized and accessed without any help from the technical staff. The benefits offered by performance analytics software and service to enterprises includes better preparation for change, superior business management, connected business processes, strategic competitive advantage, timely actionable information, and overall reduced operational risk. 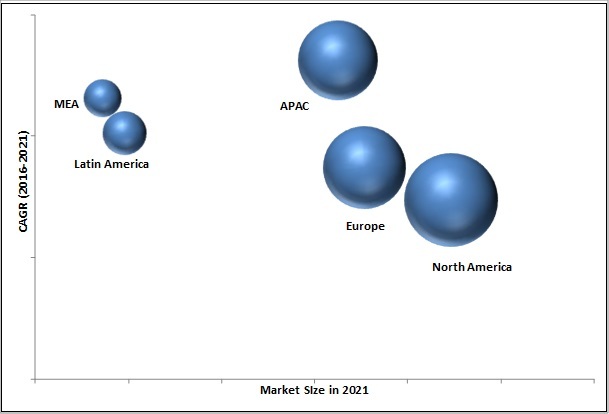 North America is expected to hold the largest market size in the overall performance analytics market, followed by Europe, owing to the technological upgradations in these regions. The adoption rate of performance analytics platform and software is increasing in APAC and Latin America due to the increasing amount of business data across various industry verticals in these regions. Performance analytics software in sales and marketing assists companies with optimized marketing spend, not in the traditional sense of applying a marketing mix model, but in delivering optimization through strategy and efficiency at the marketing process level. Additionally, sales and marketing performance analytics application also incorporates the project management process and IT management in designing and delivering tailored marketing services. This approach helps companies with the quick delivery and tailored solutions that are scalable across different regions, business segments, and functions. On implementing performance analytics software along with financial performance analytics application, companies would be able to bridge the gap between their financial performance and operational performance drivers. Performance analytics software here supports companies to have highly accurate cash flow analysis, real-time view of the financial situation, enhanced alignment with operations, apart from helping them identify variances with corrective actions and track the difference between actual financial performances against planned financial performance. All this linked with operations would result in enhanced overall increase in sales and profitability. Performance analytics enables IT operation performance analytics assist companies in efficiently managing their huge IT layer that consists of network, server & storage, and application and identifying where the fault is and providing the immediate fix that results in delivering the high quality services and applications to its end users. Network management, network traffic analysis, network configuration management, server performance management, storage device management, application performance management and end-user experience management are some of the major capabilities of performance analytics enabled IT operation performance analytics application. What are the upcoming industry applications for clickstream analytics? Today, organizations are commonly transforming their business either through subsidiaries or acquisitions. This is leading to expansion of operations and teams that needs high-tech technology to solve the issues regarding data management and analysis of various business functions. For instance, the expansion of operations leads to several structural changes within sales and requires effective sales planning and review system to maintain the growth. However, the fear of losing ownership to some potential sales data, hinders the adoption of such tools. Thus, the sales teams continue to rely on older software and solutions and are reluctant to adopt the new technologies. Moreover, the business users have uncertainties about positive Return on Investment (ROI) post implementation of such analytical tools. Therefore, such misconceptions have restrained the adoption of performance analytics solutions among the organizations.